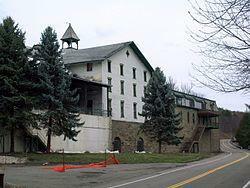 Gold Seal Winery is a historic winery complex located near Hammondsport in Steuben County, New York. The primary building on the complex is in the Italianate style and constructed in 1865. It is a three-story, 54 feet by 110 feet, stone structure built into a hillside. It features a bell tower, gable roof with dormers, stuccoed upper stories, and barrel vaults. The original building was enlarged on at least six occasions. A long, narrow stone addition (20 feet by 120 feet) was built in 1890 and expanded in 1903-1903 with a mansard roof in the Second Empire style. Another major addition was built in 1884 and expanded in 1887. It included a champagne fluting room, an additional storage vault, and tasting porch. A 54 feet by 109 feet addition of reinforced concrete was built in 1912. Other contributing buildings are the Pornace House (1909) and brandy distillery (1865).